Working and not having a kitchen hasn’t helped me to blog. It was a weird level of inertia where the days revolved around letting in builders/plasterers/plumbers/electricians whose grip on time keeping was in a parallel universe to ours. Anyway the good news is that we now have a fully functioning kitchen complete with my first daffodils of the year. Last week when I was in the supermarket I had a complete blank. I was totally lost as I had no idea what to buy considering now I had the option of an oven and hob and could cook ‘proper’ meals!! I’d been institutionalised into sandwiches, crackers and picnic food! Anyway we’re back on track again now and I have the added excitement of doing the washing up by using the dishwasher. Loading and unloading isn’t a chore yet! 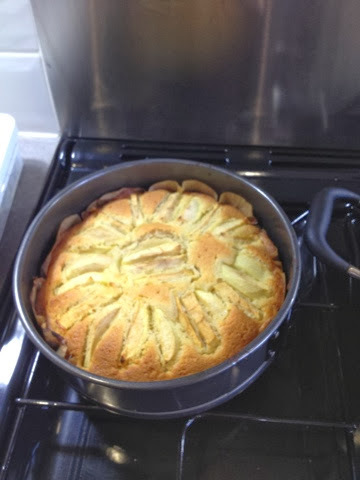 A cake has been made, once again using this fail safe recipe with the addition of apple. I find it used to take about 55-60 minutes in my old oven and now around 50-55 minutes in my new oven. I need to keep an eye on things that might need a bit more attention not to be too singed. I’m also planning to work on expanding our range of dishes once a month. I guess January has gone but I can still come up with 11 more things….a nice night in scouring my collection of cookery books to look forward to. Our bedroom is also finally finished. The curtains arrived and have been hung and the room looks complete. Now all I need to do is tidy up the toys that find their way into our room and put away the mountainous piles of washing!! We’ve all been unwell too. I had a cold then a terrible cough…you could hear me coming for miles. BigR had a strange temperature which only occurred at 3pm and left her totally flat until bedtime. LittleR just appeared not to be her usual smiley self. You’re never entirely sure if a 1 year old with a runny nose has a cold or is just teething…or more horrifically a combination of the two. Thank goodness for calpol! We all seem to be over this patch of illness now thankfully and I’m pleased the weather has been better so we’ve been able to get out and about to the park and for some short walks. I did a few short bits of gardening. Keeping on top of the weeds and making plans for growing plants and where this will go. I bought BigR some sunflower seeds and she’s itching to get those planted but I’m making her wait until March so we might get a bit more success. I can’t believe how mild this winter has been compared to last year (new baby+ partner with broken ankle+ crutches+ snow and ice = no fun) although I could do with a little more sunshine please. At the start of February and in the midst of our no kitchen nightmare I was able to attend my knitting in the round workshop. What an excellent day it was. The tutor Gwen was really approachable and friendly and we received all sorts of goodies. I now have one extra Baa Ram Ewe bag which is housing my unfinished work at the mo. Of course I am now an expert at knitting in the round and have course finished the mitts and hat that we started…hahahahahaha…..but I have made progress on the dog I’m making for LittleR the body, head and one arm is finished. I’m calling this a success! 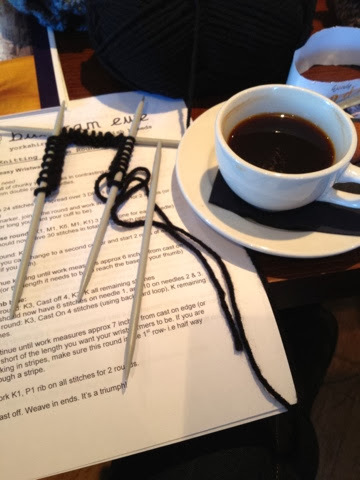 I’m keen to attend another workshop they run…maybe crochet? Maybe a more complicated knitting one? There is one on making socks…so maybe I could join in with Christina’s sock year? I also managed to finish my two books in keeping with Circle of Pine Trees. In January I read ‘The Rosie Project’ which I found to be an excellent read… I loved to hear the story form Don’s own point of view and how his search for the perfect partner can’t be pinned down on his questionnaire. In January and February I read ‘The Goldfinch’. I loved it. For about 85% of the book (yes I was using an e-reader) I loved it then I found it a little tiresome… a bit too much like she didn’t know what to do with the end and ‘so they all woke up as it was a dream’ (not the end of the book), so for me, a bit of a cop out. The book created characters that although were inherently flawed you wanted to know what happened to them and where they went but ultimately I felt a bit disappointed in the end. I’m not sorry at all that I read it though. March’s book is The Snow Child by Eowyn Ivey. I’ve heard good things and seen this on other bloggers’ lists. For a little light relief I’m also reading ‘Tales from the Secret Footballer’. I do love a bit of football. Perhaps I’ll be able to work out how to add myself to the link again too! I'm glad everyone is feeling well. I hope the kitchen is done soon. Your cake looks and sounds delicious! Sounds like we're doing a bit of a swap. I'm on the waiting list for The Goldfinch at the library and am a few pages from the end of The Snow Child. We'll have to compare notes at the end of March! Looking forward to seeing your thoughts and views on The Goldfinch. I'm so excited about the kitchen and about knitting in the round! :) I'm trying the hat first and then maybe some simple socks...I'm confused about the type of wool you need for socks...or is it a case of it doesnt really matter? Here's to a good reading month!! Ooh I am planning a new kitchen in a few months time, paper plates and picnic food here I come! It's so worth it in the end!